The Aloha was built in Mt. Clements Michigan in 1888. It sank in the area just off 9 mile point. The only fatality was Captain McVicor. He was 76 years old at the time. The Effie Mae was sank intentionally by Preserve Our Wrecks Kingston. The stripped down hull of the former dive charter vessel was donated by Ted Walker. This boat adds a little color to the site. The mooring line lands you at the forward section of the ship quite near the bow. This area is a favorite of large schools of perch that are then followed by bass looking for dinner. On the deck of the bow you will find anchor chains, a winch and assorted chains and tools. A round hole will allow you to look under the deck if you stand on your head. Proceeding aft along the port side, the holds of the ship will be visible as most of the decking is broken up. The debris is interesting to sift through though most artifacts were taken long ago by divers who didn't know any better. Near the stern on the starboard side lies the remains of the dive charter vessel Effie Mae. 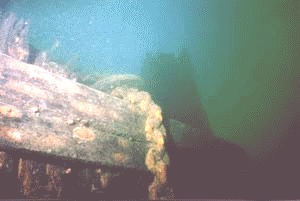 Many divers coming to Kingston have rode this wooden craft to shipwreck sites. The 40 ft. craft has been prepared properly for diving on rather than from. Divers may safely enter the boat and explore the forward cabin or stand atCaptain Ted's helm to pose for a photo. There is a plaque in the cabin. The rear decking has been removed, themast has not. Continuing back to the stern of the Aloha, you will discover more debris. Some of the decking is still in place. The bottom is sand and if you venture off the wreck on the port side you will see a clam bed. No one to our knowledge ever ate any. As you approach the bow section you can enter under the decking . Inexperieced divers should be cautious as you will technically penetrating the ship. Remember that the mooring line is at the front on the starboard side.